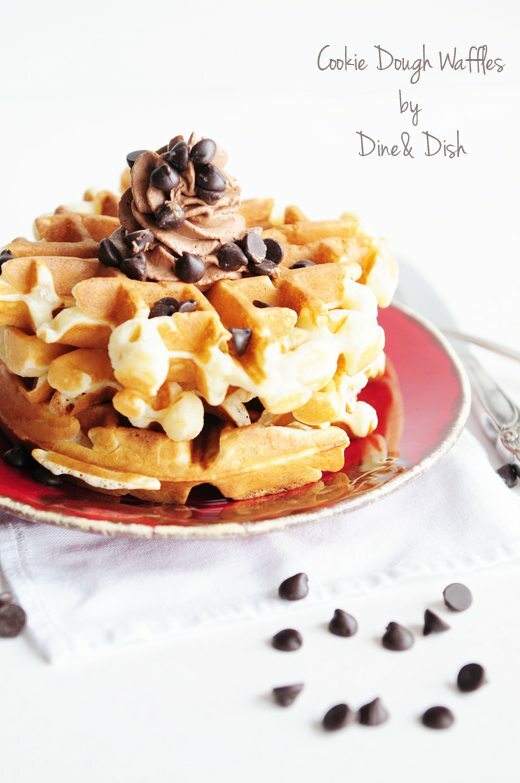 Cookie Dough lovers will absolutely flip for these amazing sweet waffles for breakfast! The giveaway is closed. Congratulations to the Sweet Tooth Runner for winning! Thanks to all who entered. Sometimes a girl just wants to have fun… well fun, and great tasting food! 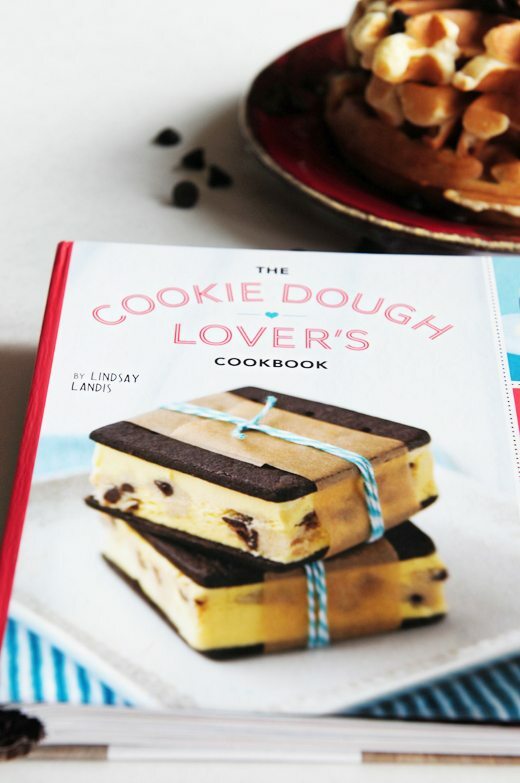 For those fun-loving friends looking to combine quirky recipes with a great time, The Cookie Dough Lover’s Cookbook by Lindsay Landis is for you. Who doesn’t love cookie dough? Imagine it turned into cookies, cakes, candies and more and it just ups the fun quotient even more. This past weekend I was getting ready to make breakfast when my daughter, Kelly, said “You know what would be good? 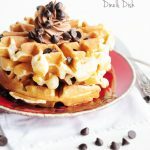 Cookie dough waffles!” I’d never heard of such a combination, but sure enough, when I grabbed my friend Lindsay’s cookbook, I found that there was a recipe for Belgian Cookie Dough Waffles with Chocolate Whipped Cream. In a jiffy, a super fun breakfast was served. In our house, cookie dough trumps cookies, candy, cake and other sweet treats! It’s the number one craved dessert and one that we try to have on hand as much as possible. (I’ll admit – sometimes we buy frozen dough just to fix a quick craving). If you love all things cookie dough, you’ll love this giveaway! The folks at Quirk Publishing have offered one lucky Dine & Dish reader the chance to win a copy of The Cookie Dough Lover’s Cookbook by Lindsay Landis. This cookbook is one you’ll definitely want to get your hands on ASAP. You won’t believe how creative some of the treats in this cookbook are. If you imagine it, I bet you can find it in Lindsay’s cookbook! To enter the giveaway, simply leave a comment on this post telling me what flavor of cookie dough is your favorite! Share, tweet or pin this post on your favorite social media outlets…Twitter, Facebook, Pinterest… leave a separate comment on this post (up to 3) for each share. All entries must be received by midnight, CST on Tuesday, July 17th. Winner will be chosen via Random.org and notified via valid email address. 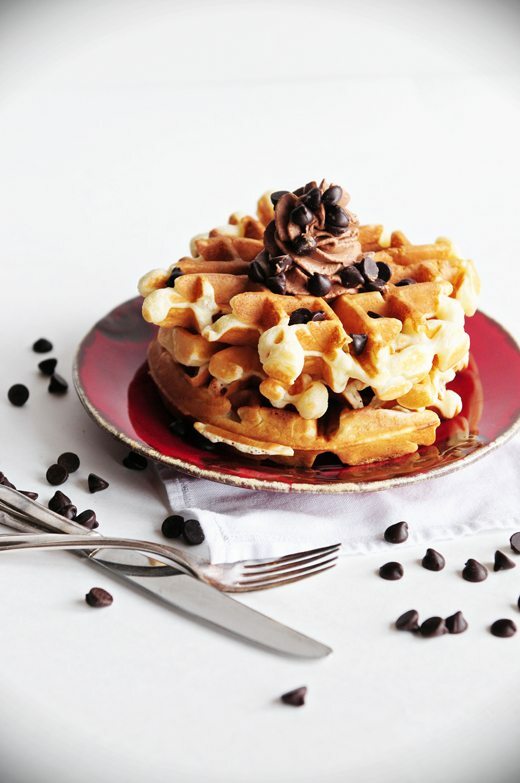 Now, here’s the recipe for waffles you won’t be able to get enough of. Enjoy! To prepare the cookie dough, beat together butter and sugars in a large mixing bowl with an electric mixer on medium speed until light and fluffy, 2 to 3 minutes. Beat in vanilla and milk. Add salt and flour and mix until incorporated. Stir in chocolate chips. Refrigerate until ready to cook waffles. To make waffles, sift together four, baking powder, baking soda, and salt. In a separate bowl, lightly whisk eggs. Whisk in buttermilk, melted butter, sugar, and vanilla. Add dry ingredients and stir until just combined. Preheat waffle maker and lightly spray with cooking spray or brush with vegetable oil. Ladle a heaping 1/2 cup of batter onto iron and quickly drop 6 to 7 marble size balls of cookie dough on top. Close lid and cook according to manufacturer's directions, until golden brown and toasted. For the whipped cream: whisk powdered sugar, cocoa powder, and 2 tablespoons of the heavy cream in a large mixing bowl or the bowl of a stand mixer until smooth. Using the whisk attachment, gradually beat the remaining 1/2 cup heavy cream into the mixture. Continue beating until stiff peaks form. Spoon onto warm waffles and serve immediately. I love my oatmeal butterscotch cookie dough! I am happiest with a basic chocolate chip! chocolate chip is really probably the best….although snickerdoodle is a close second. I pinned this link/recipe! I’m coffeebean910 on Pinterest! I love basic chocolate, its my favourite! These look so crazy good! Cookie dough in my waffles and then you added chocolate to the whip cream! Get.out.of.town. I’ve seen her cookbook all over the interwebs and I am lusting after it! My favorite cookie dough is and always will be chocolate chip. I love peanut butter cookie dough. Chocolate chip – old school all the way! To eat as dough? Chocolate chip, no nuts. At the holidays, sugar cookie! I love chocolate chip cookie dough in it’s true form. Just pinned this! Don’t want to forget to try these! I love peanut butter cookie dough…yum! Not a fan of cookie dough, but my family is. They will eat whichever kind is handy. Thanks. To eat as dough, I’m a plain chocolate chip lover. I just pinned this recipe! Looks great! My favorite is chocolate chip cookie dough. I love PB cookie dough… PB anything really! Peanut Butter cookie dough 🙂 The more PB, the better!!!! Pinned it – I am Ruth A Majors on Pintrest! Think I will be making this for breakfast in the morning – or maybe a little dessert tonight!! Let’s go for the classic – chocolate chip cookie dough! Sugar cookie dough is also pretty great! Wow. What a wonderful picture. This recipes looks so delicious! Just tweeted. Who doesn’t love all cookie dough! chocolate chip cookie dough. a classic and always tasty! I do really love anything with ginger so I’d say gingerbread! Those sure look good, I’m sure they’ll hit my waffle maker soon 🙂 Oh and my favorite cookie dough is chocolate chip of course. Aaand I shared on Facebook. Just regular chocolate chip cookie dough for me!!!! I absolutely love choc chip cookie dough!! Holy Guacamole does that look good. Could you run a couple of those waffles by my house for a midnight snack? I’ve never met a cookie dough I didn’t like, but I would have to say for pure cookie dough dining purposes, I would go with chocolate chip. My favorite cookie dough flavor is peanut butter with chocolate chips! I pinned this post under my steals and deals category. 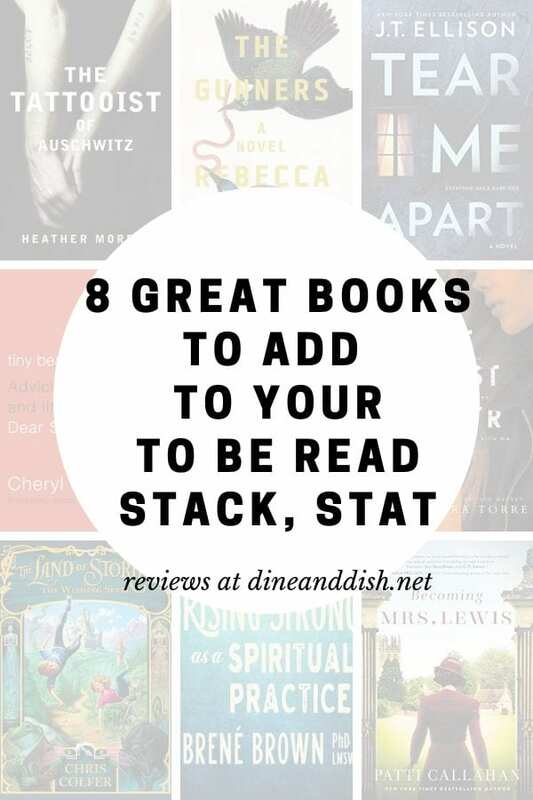 I shared this post on facebook about how much I wanted the cookie dough cookbook from this post! My favorite cookie dough is the classic chocolate chip! I love finding recipes and seeing how different people make their chocolate chip cookie dough!! I think chocolate chip cookie dough is the best! any and all cookie dough is my fave. ha! Probably a tie between my peanut butter chocolate chip and my oatmeal chocolate chip cookie dough. yum! I’d have to say my fav is probably peanut butter dough. My favorite cookie dough is chocolate chip. Or maybe sugar. Yum! It’s a tie between chocolate chip and peanut butter…ooh! Maybe a combination of the two?! Favorite would have to be the classic chocolate chip! My favorite is Super Duper Oatmeal Cookies, passed down from my grandmother. It’s a mix of chocolate chip, peanut butter and oatmeal raisin. Basically every flavor of cookie in one. PERFECTION! Regular chocolate chip cookie dough! If I’m just eating the dough, it’s gotta be chocolate chip! Monster cookie dough — yum!! Mmmmmm….chocolate chip cookie dough, of course! Often imitated, never duplicated! ANY cookie dough…but probably oatmeal or chocolate chips. Though my favorite COOKIE is snickerdoodle! Chocolate chip cookie dough! What can I say? I’m a classic kind of girl! This looks so wonderful! I’m a chocolate chip cookie dough girl all the way. My favorite cookie dough is the classic chocolate chip! My favorite cookie dough is oatmeal with raisins and nuts. Hands down, it’s got to be chocolate chip cookie dough! My favorite cookie dough flavor is oatmeal peanut butter chocolate chip! I am not trying to sound cliche,but chocolate chip really is my favorite cookie dough! I have to go with the classic on this one: chocolate chip! My favorite cookie dough flavor is chocolate with peanut butter chips. My favorite flavor of cookie dough is Oatmeal. Peanut butter cookie dough! Yum! i love me some chocolate chip cookie dough!!! but i’m not picky, I’ll eat all kinds!! How did I miss these in the book?! I need to make them soon! Kristen, these look SO yummy! My dh and I both love chocolate chip cookie dough. I think that we enjoy it even more than the cookies that I bake from it! Thanks for the opportunity to win a copy of Lindsay’s new cookbook! My favorite cookie dough is peanut butter. Chocolate chip cookie dough, please! I also pinned this on Pinterest! I love my shortbread cookie dough! Saw this cookbook at work today and started drooling. Fingers crossed! Chocolate chip is my favorite, I just love it! Oatmeal Chocolate Chip – Can’t wait to try out your recipe. Straight up chocolate chip is heavenly!!! I’m a chocolate chip girl too! Right now my favorite cookie dough is biscoff. Just can’t leave it alone. I am a classic chocolate chip cookie dough fan. Double chocolate cookie dough is my favourite. Can’t get enough of that chocolate!!!! Oh my goodness…I can’t believe that there is actually a cookie dough lovers cookbook! It is my weakness, with classic chocolate chip at the top of the chart, although I am open to tempting competition for number 1! Chocolate chip is my favorite cookie dough. I can’t help it. It’s the best! I have to agree with most of the other commenters here that chocolate chip is the best! These look great – the chocolate whipped cream…yum! My favourite cookie dough would have to be the traditional – chocolate chip! I can’t keep my fingers out of the peanut butter cookie dough when I’m baking. Chocolate Chip is the best! not very original but can’t go wrong with it. If I’m just eating the dough, then I’d have to say chocolate chip (which is funny since that isn’t my favorite type of cookie)! This sounds so good!! I will definitely be making these sometime soon. And I’d have to go with the classic, Chocolate Chip Cookie Dough!!! I agree that Chocolate Chip is pretty great, but I made Red Velvet Sugar Cookies last month and the dough was amazing! My favourite cookie dough…. chocolate chip! I would have to say chocolate chip cookie dough is my favorite, but I love any type of cookie dough! I love peanut butter cookie dough! I need these…like..now! Looks delicious 🙂 Oh great photos by the way! I’m very intrigued with this idea… And I love chocolate chip cookie dough because the texture is always nice and chewy! I am late of this giveaway. So, sad I want to get this giveaway. Classic Chocolate Chip with toasted walnuts please!!! My all time favorite is chocolate chip, with butter cookie dough coming in at a close second! Any cookie dough is sounds simply amazing.. and that’s not just because I’m pregnant! I have always been in love with anything chocolate chip cookie dough.. and those waffles made me want to run to the store and get the ingredients right this second! Maybe I will ask my husband if he would kindly stop on his way home from work 😉 Can’t wait to try! Red velvet Choc chip cookie dough- cause I make mine Oreo style and put the cream cheese frosting in between two! Chocolate Peanut butter cookie dough! These look so good, I plan on making them for Sunday brunch! Choclate chip with a hint of coffee…yummmmm.. I don’t discriminate when it comes to cookie dough, but chocolate chip is definitely my favorite! I have wanted this cookbook for so long! Thanks for the giveaway! I couldn’t Pin this fast enough! I absolutely love choc chip cookie dough! Holy crap! This sounds so good. I can’t wait to make them!! My husband will love these! How many waffles does this recipe yield? I can’t wait to try them, but I might need to invite some people over depending on how much they make? Chocolate chip cookie dough is the best! Chocolate Crinkle cookie dough is my all time favorite cookie dough flavor…..